The end-Permian Extinction - 251 M.Y.A. Cenozoic Era - 65.0 - 1.8 M.Y.A. Green Mountain - 64 - 55 M.Y.A. Wall Mountain Tuff - 36.7 M.Y.A. Guffey volcano lahar - 34.1 M.Y.A. Dakota Group (South Platte & Lytle Formation) & Morrison Formation - Interstate 70 roadcut at the Morrison exit west of Denver. Pikes Peak, at one billion years, is not the oldest geological structure in Colorado. That distinction probably belongs to Colorado's highest cliff, the 2,300 foot Painted Wall, located in Black Canyon of the Gunnison National Park, dated to 1.8 billion years. Colorado's highest peak, Mount Elbert (14,433 feet), which displays metamorphic rock estimated at 1.7 billion years is a close second, but must share second place with a number of other formations or locations. The Arapahoe Peaks, with their Boulder Creek Granodiorite, and canyons, such as the Unaweep Canyon, display formations which also go back 1.7 billion years. Other formations, not quite in the same age range, could still be described as ancient. The Mount Evans Batholith, a magma which forced its way through metamorphic rock, emerged about 1.4 billion years ago, as did the Log Cabin Batholith found at Greyrock Mountain, and the Silver Plume Granite of Longs Peak. Colorado's basement rocks, a Precambrian formation which emerged about 1.7 billion years ago, form the foundation for most of Colorado. Older still is the Precambrian basement formation of Wyoming, which begins at the Colorado-Wyoming border. Its age is 2.5 billion years. The image of Pikes Peak as silent witness to the changing landscape of Colorado for a billion years is romantic, but somewhat misleading. The granite which can be seen today on Pikes Peak provides few clues as to what the peak looked like a billion years ago. From 100 million years ago until 69 million years ago, what is now Colorado was submerged under a body of salt water, known as the Cretaceous Western Interior Sea, which stretched from western Utah to Minnesota and, from north to south, covered everything from the Arctic Ocean to the present-day Gulf of Mexico. What would become Pikes Peak, like most of the future Rocky Mountains, lay at the bottom of the sea. About 28 million years ago, it was a relatively tall 8,000 feet. Pikes Peak is formed of an intrusive igneous rock known as a pluton. (Rock is divided into three major categories: igneous, metamorphic, and sedimentary. Igneous rock is formed when magma solidifies. Granite is an example. Metamorphic rock is rock which has been changed by pressure, temperature, or the gain or loss of chemical components, whatever its original mineralogy, texture, or composition. Slates and marbles are examples of metamorphic rocks. Sedimentary rock is rock formed by the accumulation and cementation of mineral grains, which have been transported by wind, water, or ice to the site of deposition, or by chemical precipitation there. Limestone, conglomerate, and sandstone are examples of sedimentary rocks.) In contrast to volcanic magma, which remains a liquid until it breaks the surface as a lava flow or volcanic eruption, the magma which forms a pluton remains trapped underground until it cools. Cooling at a slower rate than surface lava, plutonic rock has time to form crystals. Igneous rocks generally, are formed from the cooling of magma or molten rock. Intrusive igneous rocks, while "intruding" into surrounding rock, are characterized by crystal formation, resulting from their slower cooling rate. Because of their association with the underground, they are also called plutonic rock, for Pluto, the Greek god of the underworld. Extrusive igneous rocks, formed from magmas which come to the surface before cooling, are generally known as volcanic rocks, for Vulcan, the Greek god of fire. Pyroclastic rocks are those produced in volcanic explosions, when materials are ejected into the air. Some 500 million years ago Colorado's existing mountain formations, or the flattened hills which remained of them, disappeared under a shallow sea, which covered the region for the next 200 million years. The seascape was gradually replaced by desert. Some 320-290 million years ago, what are known as the Ancestral Rockies began forming. Like their predecessors, erosion would reduce them to little more than hills. Streams coming off the mountains carried boulders, rocks, and sand down the slopes, to accumulate in streambeds below. Over time, as iron compounds mixed with the sandstone, it took on the distinctive red color of the Fountain Formation, found at places such as Red Rocks and Roxborough parks. About 280 million years ago the climate became drier. Wind, rather than streams, carried sand from place to place, depositing it in large dunes. Some, but not all, of the iron (seen in the Fountain Formation today) was gone. The resulting formations, now known as the Lyons Sandstone, would take on a pink and light brown or gray color. Around 254 million years ago (M.Y.A.) a shallow tidal sea began to replace the dunes. Algae, grew in slimy mounds, known as stromatolites, leaving layers of limestone (composed of calcium carbonate). For much of the Triassic Period the limestone layers would accumulate into what is known as the Lykins Formation. Dinosaurs made their appearance in the Late Triassic. About 100 million years ago the area around Morrison and Golden had become the shoreline of a shallow sea. The closest mountains were in what is now Utah. Like the Ancestral Rockies, erosion took its toll on these mountains as well. Washing down from the slopes, sand and gravel would be carried by rivers across Colorado and Kansas. The accumulation would become the Dakota Formation. Oddly, what would become the permanent geological record of this time would not be volcanic eruptions or lava flows, but the ripple marks left by waves on the shore. That, and the tracks of dinosaurs as they traveled from one region to another. This time, the tracks would be of Iguanodons, large plant-eaters, not quite the size of Brontosaurus, but nevertheless of impressive size. The shoreline existing at the time gradually disappeared. Colorado was once again inundated by another salt sea, the Cretaceous Western Interior Sea. Sharks replaced the dinosaurs as major predators. The skies above were patrolled by pterosaurs, flying reptiles with wingspans of twenty-five feet. Perhaps as early as 75 or 72 million years ago, another mountain-building episode began. Known as the Laramide Orogeny, it marked the beginnings of the present Rocky Mountains. The Interior Sea retreated. By 69 M.Y.A., it was gone from Colorado. The Cretaceous-Tertiary boundary, i.e., the end of the Cretaceous Period and the beginning of the Tertiary Period, is dated to 65 million years ago. It is sometimes abbreviated as K/T - (K for the German word "kreidezeit" (chalk time) and T for Tertiary). What is known as the Cretaceous-Tertiary (K/T) extinction may be more recognizable for a possible link between an asteroid collision and the disappearance of the dinosaurs. The presence of high levels of the element iridium in soils and rock, discovered in the late 1970s, suggests that some extraterrestrial event occurred 65 or 65.5 million years ago, since iridium is found in greater concentrations in meteors and asteroids. Following this observation, an impact crater was discovered beneath the Mexican town of Chixulub in the Yucatan Peninsula. The asteroid that hit was roughly the size of Denver. The end of the Cretaceous period, apart from the asteroid collision, was marked by a high level of volcanic activity, associated with the rise of the Rockies. Near Golden, lava flows would solidify into a now 1,000 foot high structure overlooking the surrounding area. Over time, a stream would cut the formation in half, leaving two separate buttes, now known as North Table Mountain and South Table Mountain, or the Table Tops. Fossil finds, (or at least a Tyrannosaurus Rex tooth) suggest that it may have been the hunting grounds for T. Rex. The Denver region as a whole turned swampy, supporting palm and walnut trees. Evidence of the swamp would be found in coal beds east of Denver when the Denver International Airport (DIA) was being constructed in 1991. By 64 million years ago, swampland had given way to rainforest. The Castle Rock Rainforest, north of Castle Rock, would be discovered in 1994. Sand and gravel began washing down from peaks between Boulder and Morrison. It accumulated just south of Golden. 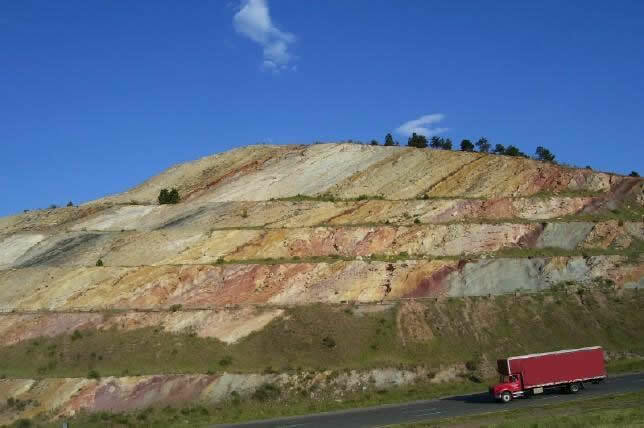 The material solidified as conglomerate in what would become known as Green Mountain. By 36 (36.7) million years ago all that remained of the mountains were hills just a few thousand feet high. It was also a time of renewed volcanic activity. A major eruption would occur somewhere in the Collegiate Range. Evidence can be found in what is known as the Wall Mountain Tuff or the Castle Rock Rhyolite, found at Rock Park in Castle Rock. The area around Castle Rock would be subject to major flooding 34 million years ago. A new period of uplift began about 28 million years ago. Those exceptionally high remains of 8,000 feet would emerge from this period as "Fourteeners," peaks over 14,000 feet, such as Mount Evans or Longs Peak. Mammoths and mastodons, as well as camels and lions, would move into the Front Range, only to themselves become extinct around the time humans entered the region some 11,000 years ago. The Golden area would serve as a gathering place for hunters around 5,000 years ago and local industry would depend on the limestone for cement, whitewash, and lime. Note: The dates assigned by geologists for the geological time scale have varied. The dates appearing first in this chart are those issued by the International Commission on Stratigraphy in 2000. Those in parentheses are alternative dates which have been used in the past. Halka Chronic and Felicie Williams, "Roadside Geology of Colorado, 2nd ed.," Mountain Press Publishing Company, (Missoula, MT 2005), p. viii, pp. 255-256. (2) Hopkins, "Hiking Colorado's Geology," pp. 18, 21, 36 & 64. (3) Hopkins, "Hiking Colorado's Geology," pp. 50-51, 62 & 67. (4) Hopkins, "Hiking Colorado's Geology," p. 37. (5) Halka Chronic, "Time, Rocks, and The Rockies: A Geologic Guide to Rocks and Trails of Rocky Mountain National Park," Mountain Press Publishing Company, (Missoula, MT 1984), p. 21. (6) Hopkins, "Hiking Colorado's Geology," p. 18. Chronic, "Time, Rocks, and The Rockies," pp. 7-9. Frank Press and Raymond Siever, "Earth, 4th ed.," W. H. Freeman and Company, (New York 1986), pp. 72-77. Randy Jacobs, ed. with Robert M. Ormes, "Guide to the Colorado Mountains, 10th edition," The Colorado Mountain Club Press, (Golden, CO 2000), p. 30. (8) Kirk R. Johnson and Robert G. Raynolds, "Ancient Denvers: Scenes from the Past 300 Million Years of the Colorado Front Range," Denver Museum of Nature & Science, (Denver 2003), p. 16. Johnson and Raynolds, "Ancient Denvers," p. 20. (10) Martin Lockley, "Fossil Footprints of the Dinosaur Ridge and Fossil Trace Areas, 2nd ed." Friends of Dinosaur Ridge and the University of Colorado at Denver Tracker Research Group, (Golden, CO 2003), p. 54. (11) Johnson and Raynolds, "Ancient Denvers," pp. 20 & 22. Chronic, "Time, Rocks, and The Rockies," pp. 19 & 21. (13) Johnson and Raynolds, "Ancient Denvers," p. 30.